We all have different definitions of what we think of as our “community”. In fact, two neighbors could live side-by-side and still feel as though they belong to two different communities. For example, one neighbor may define their community as the street they live on, while another may feel that their community extends to the entire neighborhood or even town. So how do local Charlotteans define their community? To answer that question, YourVoiceCLT surveyed 438 Charlotteans in fall 2018. Specifically, we asked respondents to tell us what they think of as their community. Some respondents had strict definitions of community such as the “5 mile radius around our home”, “20 mile radius around my property”, and “anything in a 15 minute radius”. On the other hand, some respondents had broader definitions that extended to their neighborhood (“NoDa”, “Plaza Midwood”, “Ballantyne”), town (“Mint Hill”, “Matthews”), general area within Charlotte (“East Side”, “West Side”, “South Charlotte”, “North side of Charlotte”), or all of Charlotte (“Charlotte and surrounding areas”, “Greater Charlotte area”). Some respondents had extremely broad definitions in comparison to others such as “the state of North Carolina” or “[the entire] country”. Respondents with broader definitions of community often highlighted the importance of considering nearby neighborhoods, towns, or all individual’s living in Charlotte as part of their community given the interdependence and effects one community can have on one. Relatedly, some respondents noted that their definition of community depends on the context in which it is being discussed in, but the importance of recognizing that “we are all in this together”. A small group of respondents said they think of their ethnic and/or cultural communities (“African American”, “Vietnamese”), identity group (“LGBTQ community”) or religious communities (“Catholic”, “Church”). Altogether, these various definitions point to the complexities of defining communities. As some responses highlighted, some Charlotteans have definitions of community that are strict and concise, while others had very liberal and encompassing definitions of community. Who’s keeping up with government these days? Every day it seems as though there is a new story, headline, or development in Washington. By the time you’ve caught up with yesterday’s news, you’re already behind. If you have felt like this recently, you’re not alone. According to a new survey by Pew Research Center, almost 7 in 10 Americans feel worn out by the amount of news these days. So who’s still keeping up? Survey results also showed that older groups (ages 55 and older) tend to be more attentive of government and public affairs in comparison to younger age groups (54 and younger). 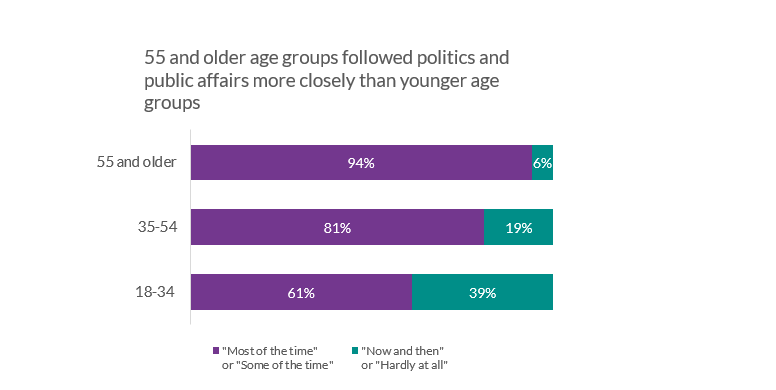 However, we also see that younger age groups (54 and younger) are still somewhat interested in keeping up with government, with 81% of 18-54 year olds indicating that they follow politics and public affairs “some of the time.” Overall, these data suggest that some folks in Charlotte are still interested in government… for now at least! Learn about our first survey and the process of analysis in our methodology report below. Results will be posted throughout the next week as we gear up for a lot more surveys in 2019! Thank you for checking out YourVoiceCLT, a Charlotte Community Survey Panel! We are committed to hearing all voices and making this panel look as much like Charlotte as possible. This means age, race, ethnicity, location, political affiliation, etc. If you choose to sign-up, you will see these kinds of questions on your profile. These questions help us be sure that our findings represent all of Charlotte. If the findings do not reflect all of Charlotte, we do not want decision-makers using the information. We promise to do everything in our power to keep your information confidential. In addition to the security of the survey tool we will be using, the University of North Carolina at Charlotte’s Institutional Review Board, which reviews the ethics of research, has and will continue to review this resource. You can contact us or them at anytime with any questions. To start, we will be accepting participants from Mecklenburg County only, but hope to expand to the region in coming years. As we build, we welcome your input – and not just on the surveys! Please share your thoughts, comments, and questions by email or on social media.